Burlington, a global diversified provider of textile solutions, is pleased to announce that it has partnered with Eastman Chemical Company for the development of woven fabrics with Eastman’s Avra™ performance fibers. Avra’s ultra-thin polyester fibers are extruded and held together by a proprietary removable polymer that can be easily woven or knit into fabrics. Once the fabric is made, the removable polymer washes away in hot water creating ribbon-like fibers that are smaller than traditional polyester fibers, resulting in a distinctly silk fabric that keeps the wearer drier and more comfortable. 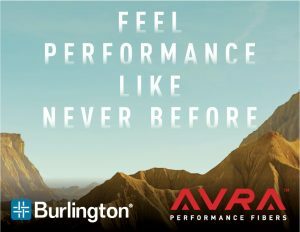 Burlington will feature garments powered by Avra™ at the Outdoor Retailer Summer Market, July 23 – 26. Available at both the Burlington booth MR#204 and the Avra™ booth 5019-LL. Come explore our many performance fabric technologies and discover what Burlington fabrics can do for you.